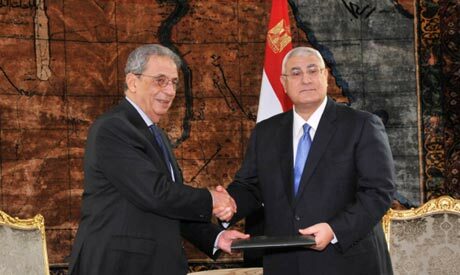 Interim President Adly Mansour with head of the 50-member constituent panel Amr Moussa in Cairo, Egypt, Tuesday, Dec 3. Egypt's recently finalised draft charter introduced a large number of new articles to, as well as omitted others from, the controversial 2012 constitution predominantly drafted by the Islamist groups in power during the term of ousted Muslim Brotherhood president Mohamed Morsi. Ahram Online has prepared a comparison between the current draft and the previous constitution, highlighting the extensive modifications which have produced the new charter. Alterations encompass the role of religion in legislation, the authority of the country's military, the system of governance, as well as the rights and freedoms of Egyptian citizens. Egypt's Interim President Adly Mansour is soon expected to announce the date for a national referendum. The 2012 constitution passed a plebiscite with a 63.8 approval rating and a 32.9 voter turnout. The 2012 constitution, written by an Islamist-dominated panel, was criticised for defining the principles of Islamic Sharia law broadly. It added Article 219, which opened the door for stricter interpretations of Sharia. Another controversial article in the 2012 constitution gave clerics a say over the meaning of the principles of Sharia. The amended constitution kept the second article stating that the principles of Sharia are the main source of legislation and left out the contentious Article 219 despite concerns raised by the Nour Party, the only Islamist member of the panel. The preamble of the amended constitution says: "We are writing a constitution that completes building a modern democratic state with a civilian government," which means neither religious nor military. Islam is the religion of the state, Arabic is its official language and the principles of Islamic Sharia are the main source of legislation. The principles of Islamic Sharia are the main source of legislation. The principles of Islamic Sharia include general evidence, foundational rules, rules of jurisprudence, and credible sources accepted in Sunni doctrines and by the larger community. The principles of the laws of Egyptian Christians and Jews are the main source of laws regulating their personal status, religious affairs, and selection of spiritual leaders. The canon principles of Egyptian Christians and Jews are the main source of legislation for their personal status laws, religious affairs and the selection of their spiritual leaders. Al-Azhar is an independent scientific Islamic body. It is solely responsible for all its affairs and it is the main reference in theology and Islamic Affairs. It is in charge of preaching, dissemination of religion and the Arabic language in Egypt and the world. The state is committed to providing sufficient funds to ensure it achieves its objectives. Al-Azhar Grand Sheikh is independent and cannot be dismissed. The law regulates the way he is chosen from among the senior scholars. Al-Azhar is an independent Islamic institution, with exclusive autonomy over its own affairs, responsible for preaching Islam, theology and the Arabic language in Egypt and the world. Al-Azhar's senior scholars are to be consulted in matters pertaining to Islamic law. The post of Al-Azhar Grand Sheikh is independent and he cannot be dismissed. The method of appointing the Grand Sheikh from among members of the senior scholars is to be determined by law. All of the above is subject to legal regulations. The new constitution gives the military more powers, critics say, as a transitional article was added requiring the approval of the Supreme Council of the Armed Forces over the appointment of the defence minister. An article allowing military trials of civilians was added in the 2012 constitution and kept in the amended 2013 version, though it is now more restrictive and specifies more clearly the crimes to which the law applies. The defense minister is the commander-in-chief of the Armed Forces, appointed from among its officers. Appointment of the defense minister should be after the approval of the Supreme Council of the Armed Forces. The provisions of this article shall apply for two terms (eight years) from the date of the adoption of this constitution. The defense minister is the commander-in-chief of the Armed Forces, and is appointed from among its officers. Civilians are not to be tried in military courts except for crimes that represent direct attacks on military installations, camps or what is in its territory, military border zones, equipment, vehicles, weapons, ammunition, documents, secrets, public funds, military factories, crimes related to conscription, and crimes that represent a direct assault on its officers or members performing their jobs. The new constitution is seen as providing more rights and freedoms in general, with more rights for women, the media and minorities. It states explicitly that women are equal to men, allowing them to hold official and judicial posts. New articles criminalise torture, discrimination and arbitrary forced displacement, from which Christians have suffered in times of sectarian strife. It also mandates the state must abide by international human rights agreements signed by Egypt. The state shall ensure the achievement of equality between women and men in all civil, political, economic, social and cultural rights in accordance with the provisions of the constitution. The state shall endeavor to take measures ensuring the adequate representation of women in parliament, as prescribed by law, and to ensure women's right to hold public office and senior management positions in the state and to be recruited by judicial institutions without discrimination. The state is committed to the protection of women against all forms of violence, and to empower women to balance their family and work duties. It is also committed to providing care and protection to mothers, children, women-headed households, elderly and the neediest women. The state shall ensure maternal and child health services free of charge, and enable a balance between a woman's duties toward her family and her work. In the preamble: Further, there is no dignity for a country in which women are not honoured. Women are the sisters of men and hold the fort of motherhood; they are half of society and partners in all national gains and responsibilities. The new constitution prohibits in clear wording political parties based on religion, which could impact many parties formed after January 25 uprising, most importantly the Salafist Nour Party and the Muslim Brotherhood's Freedom and Justice Party. Citizens have the right to form political parties with notification regulated by law. It is prohibited to engage in any political activity or to form political parties on a religious basis or a discriminatory basis of gender, origin, sect or geography. It is prohibited to exercise activities against democracy, secretive, having a military or military-like nature. Political parties can only be dissolved with a court ruling. Freedom of belief is absolute. Freedom of religious practice and the establishment of houses of worship for the believers in heavenly religions [Islam, Christianity and Judaism] is a right regulated by law. Citizens are equal before the law; they are equal in rights, freedoms and public duties, without discrimination on the basis of religion, belief, gender, origin, race, colour, language, disability, social status, political affiliation, geographical location or any other reason. Discrimination and inciting hatred is a crime punishable by law. The state is obliged to take the necessary measures to eliminate all forms of discrimination and the law regulates the establishment of an independent commission for this purpose. The accused possesses the right to remain silent. Any statement that is proven to have been given by the detainee under pressure of any of that which is stated above, or the threat of such, shall be considered null and void. Arbitrary forced displacement of citizens in all its forms and manifestations is prohibited and violating this is a crime with no statute of limitations. The state is committed to international human rights covenants and agreements ratified by Egypt, which have force of law after being published in accordance to the prescribed conditions. Freedom of belief is inviolable. The state shall guarantee freedom of religious practice and the establishment of worship places for heavenly religions (Islam, Christianity and Judaism) as regulated by law. The state shall endeavor to adequately represent workers and peasants in the first elected parliament after the adoption of this constitution, as prescribed by law. The state shall endeavor to adequately represent youth, Christians, disabled people and Egyptians living abroad in the first elected parliament after the adoption of this constitution, as prescribed by law. In this House of Representatives, peasants and workers shall have a minimum of 50 percent representation. It is prohibited to have any kind of censorship, forfeiture, suspension or closure of newspapers and Egyptian media. Exceptions allowed in specific censorship during wartime or public mobilisation. "Passive sanctions" on freedoms should not be imposed in crimes of publication or publicity; crimes related to inciting violence, discrimination or libel is sanctioned by law. Freedom of the press, printing, publication and mass media shall be guaranteed. The media shall be free and independent to serve the community and to express the different trends in public opinion, and contribute to shaping and directing in accordance with the basic principles of the state and society, and to maintain rights, freedoms and public duties, respecting the sanctity of the private lives of citizens and the requirements of national security. The closure or confiscation of media outlets is prohibited except with a court order. Control over the media is prohibited, with the exception of specific censorship that may be imposed in times of war or public mobilisation. The state shall develop and implement a plan for the comprehensive economic and urban development of border and underprivileged areas, including Upper Egypt, Sinai, Matrouh, and Nubia. This is to be achieved by the participation of the residents of these areas in the development projects and the priority in benefiting from them, taking into account the cultural and environmental patterns of the local community, within ten years from the date that this Constitution comes into effect, in the manner organized by law. The state shall work on planning and executing development projects to restore the people of Nuba to their original areas of origin and develop it within ten years, as organised by the law. Chapter 5 of Egypt's draft constitution deals with the country's system of governance, and includes articles dealing with the executive, legislative and judicial branches of government. Amendments to the 2012 constitution are evident throughout Chapter 5. The amendments give parliament the right to withdraw confidence from the president, a right which was absent from the previous charter. Amendments also prohibit the president and parliament from concluding treaties that concede national territory, and give the president the power to choose certain powerful ministers in the event a majority party in parliament nominates a prime minister. The amended articles also give parliament the right to impeach the president if he breaches the provisions of the constitution, a power not found in the 2012 constitution. One of the most significant changes is the appointment of the prosecutor-general; while in the 2012 charter the president was tasked with appointing him, the 2013 amendments explicitly state that the Supreme Judicial Council possesses that right. The following is a comparison between the 2012 and 2013 versions of some of the articles. The House of Representatives shall elect, in the first meeting of its regular annual session, a speaker and two deputy speakers for the full legislative term. If the seat of either becomes vacant, the House of Representatives shall elect a replacement. The inner bylaws of the house shall determine the rules and procedures of election. In the case of the disruption of either's obligations, one third of the members of the house could request that he be relieved from his post. The decision is issued by a two-third majority of its members. In all cases, the speaker or either of the deputy speakers may not be re-elected in the following term. Each house shall elect, in the first meeting of its regular annual session, a speaker and two deputy speakers for the full legislative term in the case of the House of Representatives, and for half of the legislative term in the case of the Shura Council. If the seat of either becomes vacant, the Shura Council or House of Representatives shall elect a replacement, whose term will last until the end of their predecessor’s. In all cases, one third of the members of either house could request a new election of the Speaker or Deputy Speakers in the first meeting of the regular annual session. Representatives except when necessary and by a causative decision and following a public referendum. The House of Representatives may not be dissolved for the same cause for which the immediately previous House of Representatives was dissolved. The president of the republic shall issue a decision halting the sessions of the house and put the decision to dissolve it to referendum within 20 days at most. If the participants in the referendum approve with a majority of valid votes, the president of the republic shall issue the dissolution decree and call for early elections within 30 days at most from the day of the decree's issuance. The new house shall meet within 10 days following the final result's announcement. Representatives except by a causative decision and following a public referendum. The House of Representatives may not be dissolved during its first annual session, nor for the same cause for which the immediately previous House of Representatives was dissolved. The president of the republic shall issue a decision halting the sessions of the house and put the decision to dissolve it to referendum within 20 days at most. If the participants in the referendum approve the house's dissolution with a majority of valid votes, the president of the republic shall issue the decree to dissolve the house and call for early elections within 30 days at most from the day of the decree's issuance. If the majority do not approve the dissolution, the president must submit his resignation. If the referendum is not carried out within the given period, the house shall reconvene the day after the end of the given period. The president is the head of state and chief of the executive branch of government. He looks after the interests of the people, safeguards the independence, unity and territorial integrity of the motherland, and is committed to the provisions of the constitution. He carries out his responsibilities in the manner prescribed by the constitution. The president is the head of state and chief of the executive branch of government. He looks after the interests of the people, safeguards the independence and territorial integrity of the motherland, and observes the separation between powers. A presidential candidate must be an Egyptian citizen born to Egyptian parents. He and his parents must have carried no other citizenship. He must have civil and political rights, and must have fulfilled his military service or been legally exempted from it and at the time of nomination cannot be younger than 40 Gregorian years. Other conditions for nomination are determined by law. A presidential candidate must be an Egyptian citizen born to Egyptian parents, must have carried no other citizenship, must have civil and political rights, cannot be married to a non-Egyptian, and at the time of nomination cannot be younger than 40 Gregorian years. If the House of Representatives is dissolved, the oath is to be taken before the general assembly of the Supreme Constitutional Court. Before assuming the presidential position, the president of the republic shall take the following oath before the House of Representatives and the Shura Council: “I swear by Almighty God to loyally uphold the republican system, to respect the constitution and the law, to fully look after the interests of the people and to safeguard the independence and territorial integrity of the motherland." If the House of Representatives is dissolved, the oath is to be taken before the Shura Council. The president of the republic appoints the prime minister, who shall be assigned by the president the task of forming the cabinet and presenting its programme to the House of Representatives. If the cabinet is not granted confidence by the majority of House of Representatives members within 30 days at most, the president shall appoint the prime minister nominated by the party or coalition that holds the majority of house seats. If the cabinet of that appointed prime minister does not obtain the confidence of the majority of the House of Representatives members within 30 days, the house is considered dissolved and the president of the republic shall call for the election of a new House of Representatives within 60 days from the date the dissolution is announced. In all cases, the sum of the periods set forth in this article should not exceed 60 days. The president of the republic, in consultation with the prime minister, shall appoint the ministers of defence, interior, foreign affairs and justice if the cabinet is appointed by the majority party in the House of Representatives, or by a coalition that comprises a majority. The president of the republic appoints the prime minister, who shall be assigned by the president the task of forming the cabinet and presenting its programme to the House of Representatives within 30 days at most. If the cabinet is not granted parliamentary confidence, the president shall appoint another prime minister from the party that holds the majority of seats in the House of Representatives. If the cabinet of that appointed prime minister does not obtain parliamentary confidence within a similar period, the House of Representatives then appoints a prime minister who shall be assigned by the president the task of forming a cabinet, provided that this cabinet obtains parliamentary confidence within a similar period. Otherwise, the president of the republic shall dissolve the House of Representatives and call for the election of a new House of Representatives within 60 days from the date the dissolution is announced. The president of the republic shall represent the state in foreign relations and shall conclude treaties and ratify them after the approval of the House of Representatives. Such treaties shall have the force of law after publication, according to the provisions of the constitution. Any treaty of peace, alliance, and all treaties related to the rights of sovereignty must be subjected to a popular referendum. Such treaties are not ratified unless approved by referendum. In any case, no treaty contrary to the provisions of the constitution or concedes any part of state territory shall be concluded. The president of the republic shall represent the state in foreign relations and shall conclude treaties and ratify them after the approval of the House of Representatives and the Shura Council. Such treaties shall have the force of law after ratification and publication, according to established procedures. Approval must be acquired from both legislative houses with a two thirds majority of their members for any treaty of peace, alliance, and all treaties related to the rights of sovereignty. The president of the republic shall declare, after consultation with the cabinet, a state of emergency in the manner regulated by law. Such proclamation must be submitted to the House of Representatives within the following seven days for consideration. If the declaration takes place when the House of Representatives is not in its normal session, a session is called for immediately. In any case, a majority of the members of the House must approve declaring a state of emergency. The declaration shall be for a specified period not exceeding three months, which can only be extended by another similar period upon the two-thirds majority by the house. If the house is not in session, the matter is submitted to the cabinet for approval, to be presented to the new House of Representatives in its first session. Such proclamation must be submitted to the House of Representatives within the following seven days. If the declaration takes place when the House of Representatives is not in session, a session is called for immediately. In case the House of Representatives is dissolved, the matter shall be submitted to the Shura Council, all within the period specified in the preceding paragraph. The declaration of a state of emergency must be approved by a majority of members of each Council. The declaration shall be for a specified period not exceeding six months, which can only be extended by another similar period upon the people’s approval in a public referendum. The president of the republic may submit his resignation to the House of Representatives. If the house is not in session, he shall submit it to the general assembly of the Supreme Constitutional Court. For the president of the republic to resign, a letter of resignation must be presented to the House of Representatives. A charge of breaching the provisions of the constitutions or of felony or treason against the president of the republic is to be based on a motion signed by at least the majority of the members of the House of Representatives. An impeachment is to be issued only by a two-thirds majority of the members of the House and after an investigation carried out by the prosecutor-general and if rendered unable he is replaced by one of the assistant prosecutor-generals. The president of the republic shall be tried before a special court headed by the president of the Supreme Judicial Council, with the membership of the longest-serving Deputy of the president of the Supreme Constitutional Court and the State Council, and the two longest-serving presidents of the Court of Appeals; the prosecution to be carried out before such court by the prosecutor-general. If any of them is rendered unable, he is replaced by his follower in seniority. The court verdict is final and cannot be appealed. A charge of felony or treason against the president of the republic is to be based on a motion signed by at least one-third of the members of the House of Representatives. An impeachment is to be issued only by a two-thirds majority of the members of the House of Representatives. The president of the republic shall be tried before a special court headed by the president of the Supreme Judicial Council, with the membership of the longest-serving Deputy of the president of the Supreme Constitutional Court and the State Council, and the two longest-serving presidents of the Court of Appeals; the prosecution to be carried out before such court by the prosecutor-general. If any of them is rendered unable, he is replaced by his follower in seniority. The House of Representatives can propose withdrawing confidence from the president of the republic and early presidential elections based on a causative motion signed by the majority of House of Representatives members at least and the approval of two-thirds of its members. The motion cannot be presented for the same cause during the presidential term more than once. As soon as the proposal is approved, the matter of withdrawing confidence and holding early presidential elections is subjected to a popular referendum called for by the prime minister. If a majority approves the decision to withdraw confidence, the president of the republic is relieved from his post which then becomes vacant. The early presidential elections shall be held within 60 days from the date the referendum result was announced. If the referendum results in disapproval, the House of Representatives is considered dissolved and the president of the republic shall call for electing a new house within 30 days from the date of dissolution. Each judicial body shall administer its own affairs; each body shall have an independent budget subject to discussion by the House of Representatives in detail and be incorporated in the state budget as one figure. Each judicial body shall be consulted on the draft laws governing its affairs. Each judiciary body shall administer its own affairs; each body shall have an independent budget and be consulted on the draft laws governing its affairs, by the means that are regulated by law. The Public Prosecution is an integral part of the judiciary, to investigate, press and follow charges in all criminal cases except what is exempted by law. Other competencies shall be defined by law. The Public Prosecution is conducted by a prosecutor-general appointed by the Supreme Judicial Council, from among the Deputies to the president of the Court of Cassation, or Presidents of the Court of Appeals or the Assistant prosecutor-generals, and the president of the republic issues a decision to appoint him for a period of four years, or for the period remaining until retirement age, whichever comes first, and only once during the judge’s career. The Public Prosecution is conducted by a prosecutor-general appointed by the president of the republic, based on the selection of the Supreme Judicial Council from among the Deputies to the president of the Court of Cassation, the Presidents of the Court of Appeals and Assistant prosecutor-generals, for a period of four years, or for the period remaining until retirement age, whichever comes first, and only once during the judge’s career. The articles from the 2012 constitution are from the official translation. The articles from the 2013 constitution were translated by Ahram Online. Does the new Constitution retain guarantees in 2012 text Article 35 i.e.“Unless caught in the act, a person can only be arrested, searched, jailed, prevented from travel, or in any other way restricted in his freedom if doing so follows a court order. Anyone whose freedom has been curtailed is entitled to receive a written notice listing the reasons within twelve hours. Within 24 hours of the curtailment of his freedom, a person must be brought before the investigating authority. This must happen in the presence of his attorney. If he does not have an attorney, one will be provided for him. The law specifies the rules for detention, its duration, its reasons, and for the right to compensation either for temporary detention or for the completion of a sentence that a court has revoked.” Many thanks for any clarification. First Real Affective Egyption Constitution Ever . I was really impressed by this constitution , and to be more honest i have never read anything has to deal with politics . I really hope to start executing this constitution. article 74 is criminal and undemocratic. No party may be based on the religion of Muhammed, but political parties may well be based on the ideas of Marx and Lenin. What kind of constitution is this????? With all due respct sir, Islam is and has always been a system of government, a state structure, a way of life, way of thinking, there is no room for "politics", islam is an all-encompasing state-hood, a totalitarian regime that cannot "share" political power in the modern sense. Have it as a private, peacefull and personal spiritual reliationship with your god if you will, but that was not what islam, in its purest sense, was intended for. religion and politics don't mix. If you want to live like a 7th century arabian cave man, knock yourself out, but let other people to make their own decisions. Dear George, Marx and Lenin definitively didn't found a religion, they were atheists and did not hide behind a God or a religion and did not say they were choosen by a God to be the leaders of the sheepfolk., That is the big difference. But maybe it is tooooo difficult to understand for you.. Fake troll with a phony Christian name. Marx and Lenin founded political movements. Our Prophet Muhammad (pbuh) never founded any political party, it was the Caliphs who came later that make the religion also a state affair. Islam is a beautiful religion, but politics is dirty.